With the holidays fast approaching, it's that perfect time of year for last-minute gift panics. You might be set--having gotten everything you need between Black Friday and Cyber Monday--or, like me, you might be staring desolately at store shelves, wondering what in the holly-loving universe to buy for those last four people on your list. Well, sad, procrastinating Christmas shopper, I'm here to help. It's literally impossible to go wrong with a gift basket--even the Grinch could find something to enjoy in a well-made Christmas gift basket, I think. There's a little something for everyone, and who doesn't love a night in with their favorite fandom? The beautiful thing about this basket is that it can work for any fandom. (It would even work without a fandom theme, but who wants to do that?) So, without further ado, here is the recipe for the perfect fandom gift basket. 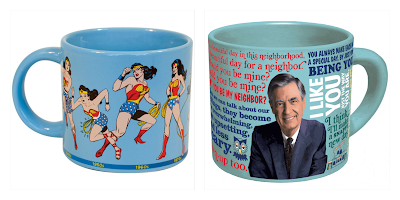 Feel free to skip steps in order to make it perfect for your fandom-loving friend or family member. Now, the key part of a good gift basket is the basket. Most people ignore this step, opting to instead go for the second-hand basket that’s been sitting in Grandma’s attic for as long as you can remember--you know the one: woven pieces of wood that poke you if you hold it wrong, that one spot of dust that just won't come off--or, even worse, the cardboard shoebox. After all, it's just holding the real present, right? WRONG. A good basket is part of the present. Every single person, without fail, could probably use more storage space. What are they going to do with Grandma’s basket? They're going to put it in their own attic to regift in ten years. A good gift basket starts with a usable basket. 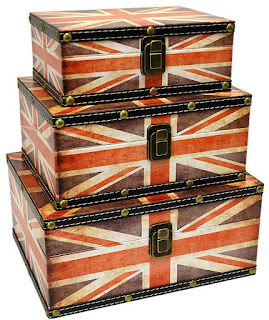 Like these beauties for all you BBC junkies. Buy them here. But if, like me, you're not made of money, dollar stores and closeout stores often have a wide array of inexpensive, cute, and highly functional baskets. I've used shower caddies for college student gift baskets and popcorn boxes for a good movie night basket, but by far the best are lidded rectangular boxes. Lids allow for easy reuse because they hide whatever junk you want to throw in there and look pretty while doing it. You can find fandom themed boxes on etsy or dedicated fandom sites, or you can just go with a nice, cheap patterned box that matches your fandom colors. 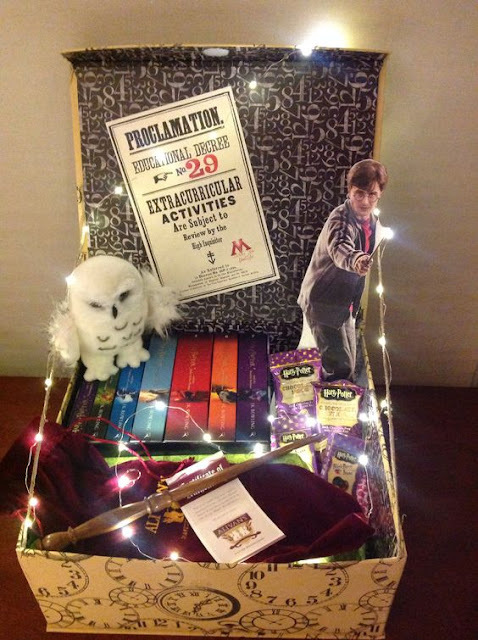 A Sherlock-themed basket might be navy blue, while a Harry Potter one could be gold with a big red bow. The possibilities are endless. If you're feeling crafty, considering decopaging or painting your favorite map onto a box from the dollar store. Perfect and priceless. What's the most necessary part of settling in for a night of your favorite fandom, be it book, show, or movie? The comfy blanket. The fuzzy socks. The oversized sweatshirt and pajama pants. A staple of every good night-in gift basket is a blanket. You can find a cheap, solid-colored one at any big box store (they're usually about five dollars around the holidays), or you can get more fandom specific and check out these warm, geeky blankets at ThinkGeek or your favorite fandom site. Along with a blanket, other good comfy box fillers include fuzzy socks and fandom tshirts or pajama pants. Some good places for these are Out of Print Clothing, Hot Topic, and f.y.e.--though you can find fandom clothing literally everywhere on the internet, and in a lot of stores, too. The perfect fandom night requires putting yourself in the right frame of mind. While just simply sitting down to binge can be cathartic, it's better to get yourself ready for it, build a little antici--say it!--pation. And while most people won't do a lot for themselves, a gift basket is a great excuse to get people things they wouldn't necessarily buy for themselves. Like LUSH Bath Bombs. For the Rocky Horror Picture Show fanatic. Most people won't spend the money or time to treat themselves to luxuries. That's what gifts are for. Bath products, fancy lotion, nail polish, chapstick, fun make-up--all good options for the fangirl in your life. Or how about some Whiskey River Soap for Geeks or Hipsters? Buy them something they wouldn't think they need. (But totally do.) Like candles. Fandom candles. Frostbeard Studio has amazing bookish candles. Snacks are the single most important thing for any fandom gift basket. The beautiful thing about this is that it can be fandom-related or just everyday movie snacks, and both will look perfectly in place. 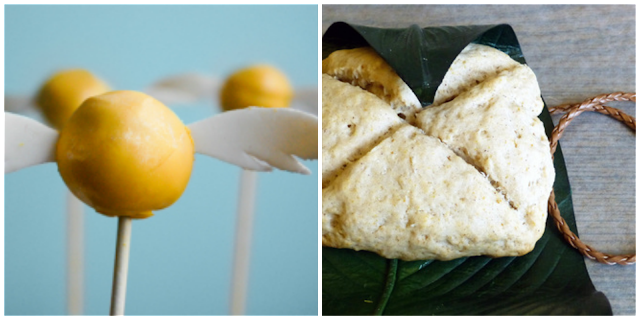 If you've got time on your hands, find a recipe for lembas bread or butterbeer cake pops to make, and fill the basket with homemade fandom goodies. If you're pressed for time, there are plenty of people on the internet willing to make fandom foods for you--trust them at your own risk. Find the recipes here and here. The necessary snacks can really be broken down into three categories: drinks, food, and the things to put them in. Drinks are usually going to be less fandom-related, since you can't include anything that will spoil. Sodas are always a good option, and the glass bottles that are popular around the holidays look pretty in any gift basket. Coffee, tea, and hot cocoa are also always winners. They come in individual packets and are generally universally liked. Plus, a hot beverage on a cold night is the perfect addition to any fandom night. Once you've got drinks covered, pick the snacks to match. Obviously, tailor this to whomever you're giving the basket. Some of my frequent go-to gift basket snacks are popcorn, candy, chocolate, biscotti, cookies, peanut butter, dried fruit, chips, pretzels, and/or nuts. It's good to get a nice mix of healthy and unhealthy snacks, so your fan friend doesn't feel guilty (or sick) after eating all the delicious snacks you gave them. You can even tailor the pre-bought snacks to the fandom. I'm sure a Supernatural fan would appreciate some pie, while a Gilmore Girls junkie might appreciate coffee, coffee creamer, coffee syrups, coffee stirrers... yeah. Get creative. But keep in mind the person you're buying for. Every basket needs at least one fandom-specific item: a towel for your favorite galactic hitchhiker, a glittery apple for your Twilight die-hard, a scarf for your Sherlocked friend, an embroidered quote for your Jane Austen aficionado... you get the idea. But with that, you also might want to include a book or movie in case the recipient of this perfect basket suddenly loses their wifi connection. If they're a Winnie the Pooh lover, buy them a kids' storybook that they don't already have. If they don't have their favorite show on DVD, see if you can find the first season at a second-hand store. Or, if they're an impulsive buyer and already have everything related to their fandom, see if you can find something similar that they might like. Set them on the next dark and twisting path toward the heart of another fandom. Buy an Austen fan a Brontë book. Buy a Sherlock fan the original Arthur Conan Doyle stories. Buy a Rocky Horror fan the movie Labyrinth. Make sure your basket has everything you'd need for the perfect fandom night. 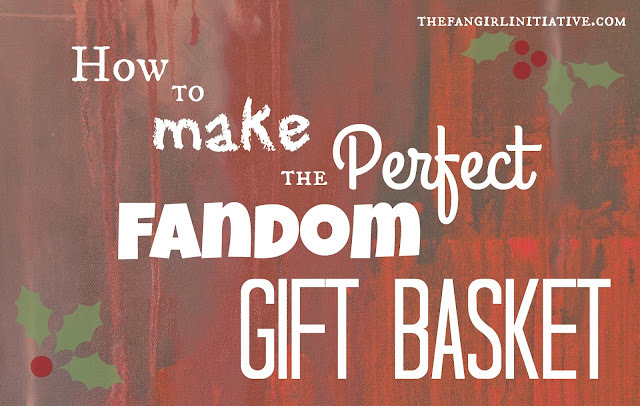 Now that you've got everything you need for your perfect fandom gift basket, it's time to arrange it all. Put it all in your carefully chosen box so that nearly everything is visible and accessible, without a Jenga disaster of fandom accessories crushing the nearest potted plant. If you notice holes in your basket, good fillers include notebooks, framed quotes or prints, Christmas ornaments, pens, play-dough, keychains, figurines, crayons, coloring books, and jewelry. And of course, don't forget the fandom essentials: tissues. 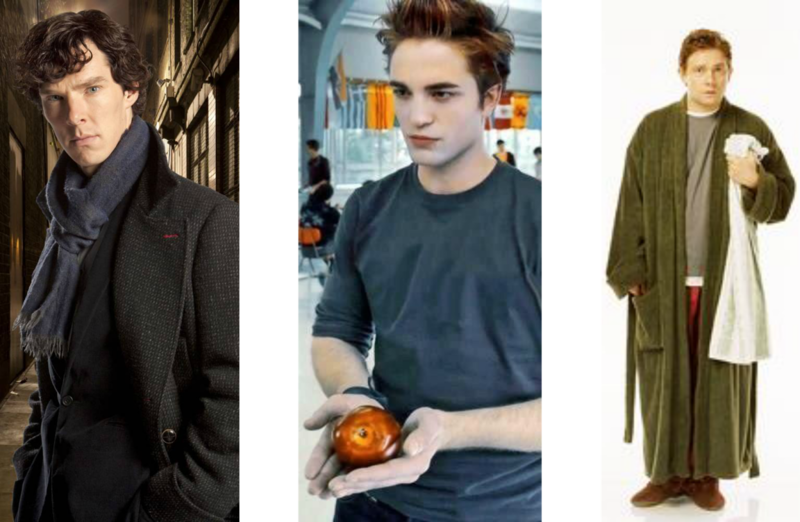 Because every fandom will inevitably make you cry every kind of tear there is. And the other essential: the preprogrammed number of a best friend who will listen to every fandom rant, whether they're a part of the fandom or not. Because even if you put together the perfect gift, the best gift of all is the gift of your time and energy. What's the best fandom gift you've ever received?